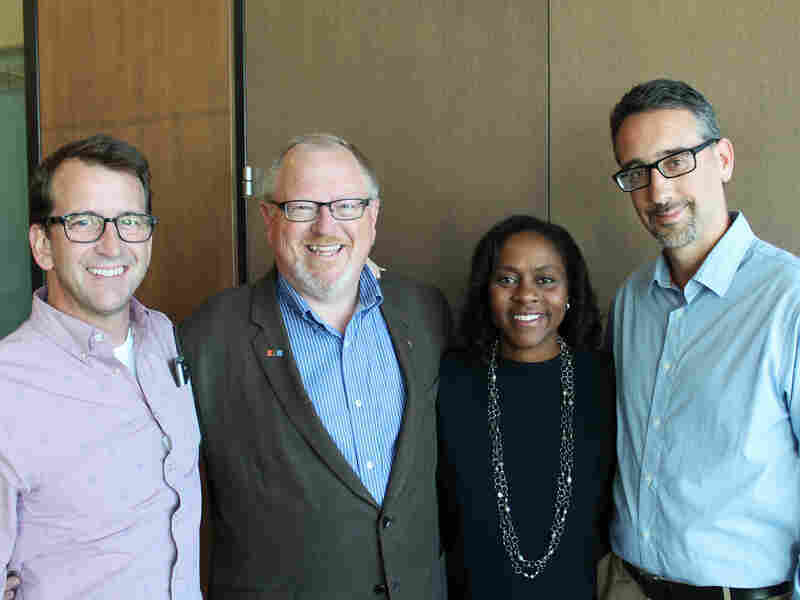 September 21, 2017; Washington, D.C. – In an online vote that closed on September 5, 2017, the NPR membership elected Mike Crane from WHA-AM (Madison, WI) (incumbent), Wonya Lucas from WABE-FM (Atlanta, GA) (incumbent), John Decker from KPBS (San Diego, CA), and Nico Leone from KCUR-FM (Kansas City, MO) as Member Directors of the NPR Board, all for three-year terms beginning in November 2017. Ms. Lucas, who has been filling an unexpired term vacancy on the Board since May 2017, was elected to her first full three-year term, and Mr. Crane was elected to his second three-year term. In addition, the NPR membership confirmed the Board's election of Fred Dust, Paul Haaga, Jr., and Jeff Sine to three-year terms as Public Directors, beginning in November 2017. Mr. Dust (who has been filling an unexpired term vacancy since September 2015) and Mr. Sine (who has been filling a newly-created Member Director position with a partial term of May-November 2017) were elected to their first full three-year terms, and Mr. Haaga was elected to a second three-year term. On a separate ballot, PRSS representatives ratified the Board's election of Sally Kane, Chief Executive Officer of the National Federation of Community Broadcasters, to a second three-year term as a Non-Board Distribution/Interconnection Committee member, beginning in November 2017. NPR's 23-member Board of Directors is comprised of 12 Member Directors who are managers of NPR Member stations and are elected to the Board by their fellow Member stations, 9 Public Directors who are prominent members of the public selected by the Board and confirmed by NPR Member stations, the NPR Foundation Chair, and the NPR President & CEO. Mike Crane is the Director of Wisconsin Public Radio (WPR). He joined WPR as Chief Operating Officer in 2008 and was promoted to Director in 2010. Under Crane's leadership, the station launched a Journalism Innovation Fund in 2013, supported the development of young broadcast journalists with the Lee Ester Fellowship and established partnerships with leading investigative journalism organizations. New programs, like Central Time, and the nationally recognized sense-of-place series Wisconsin Life, which is now a television series in partnership with Wisconsin Public Television, were created under his watch. Crane's broadcasting career includes leadership roles with Vermont Public Radio – where he served as program director and internet strategist, WMFE in Orlando, FL – where he led both public TV and radio programming and technology teams and WSKG in Binghamton, NY, where he started his professional career on-air in 1982. Crane was a founding member of the board of Public Radio Program Directors, Inc.
John Decker is the Director of Programming for KPBS TV/FM in San Diego, CA. In his current position, Decker launched the KPBS Explore Local Program Project to increase the amount of local programming available on radio, TV and online. KPBS Explore has brought to life Ken Kramer's About San Diego, Crossing South, A Growing Passion, Incoming, My First Day, plus the forthcoming A History of San Diego's Gay Bars. He has been Executive Producer of numerous award-winning local programs including These Days (now Midday Edition), A Way With Words, and KPBS SPECTRUM, plus he was coordinating manager of the KPBS Fronteras Desk local journalism collaborative. Decker joined KPBS Radio in 1995 and has held multiple positions of leadership during his tenure. He has served with Public Radio Program Directors, Inc, Latino Public Broadcasting, NPR and Public Television Programmers Association. Nico Leone became KCUR's General Manager in August 2012. Under Leone's leadership, KCUR's newsroom has doubled in size, and KCUR has become one of the most collaborative public radio stations in the country. Leone managed the transition of Harvest Public Media from a grant-funded startup into a self-supporting collaboration of six partners, and transformed the Kansas News Service from a stand-alone digital news operation into a collaboration of four public radio stations covering health, education and politics in Kansas. Prior to joining KCUR he held several positions at KDHX in St. Louis including Co-Executive Director, where he oversaw the public-facing operations, managing programming, development, marketing and community outreach. During his time at the station, he oversaw major programming changes; led KDHX through several major CPB-funded initiatives, including the Station Renewal Project and Leadership for Philanthropy; and launched the station's first capital campaign to fund a new home. Wonya Lucas is President and CEO of Public Broadcasting Atlanta where she oversees the organization's public radio (WABE) and public television (PBA) stations. She is currently serving as an NPR board member. Previously, Lucas was President and CEO for TV One where she was the second African-American woman to be President and CEO of a cable television company. Prior to joining TV One, Lucas held several positions at Discovery Communications including Executive Vice President and Chief Operating Officer for Discovery Channel and Science Channel and Global Chief Marketing Officer with responsibility for marketing in 210 countries and over 130 networks. Prior to joining Discovery Communications in 2008, Lucas served as General Manager and Executive Vice President of The Weather Channel Networks, where she was responsible for corporate strategy and development, strategic marketing for The Weather Channel, Weather Channel radio and weather.com. Before joining The Weather Channel in 2002 as Executive Vice President of Marketing, Lucas held several positions at Turner Broadcasting System, including Senior Vice President of Strategic Marketing for cnn.com, CNN radio and CNN Networks Worldwide, Vice President of Business Operations and Network Development for Turner Entertainment and Vice President of Entertainment Marketing for TNT. The NPR Board of Directors is responsible for the governance of our 501(c)(3) nonprofit corporation. The Board sets the policies and overall direction for NPR management, monitors the performance of NPR, and provides financial oversight.